Overarching aspects of architecture context that relate to all models All Viewpoint Articulate the data relationships and alignment structures in the architecture content Data and Information Viewpoint Articulate applicable Operational, Business, Technical, and Industry policy, standards, guidance, constraints, and forecasts Standards Viewpoint Systems Viewpoint Articulate the legacy systems or independent systems, their composition, interconnectivity, and context providing for, or supporting, DoD functions Services Viewpoint Articulate the performers, activities, services, and their exchanges providing for, or supporting, DoD functions Operational Viewpoint Articulate operational scenarios, processes, activities & requirements Capability Viewpoint Articulate the capability requirement, delivery timing, and deployed capability Describes the relationships between operational and capability requirements and the various projects being implemented; Details dependencies between capability management and the Defense Acquisition System process. 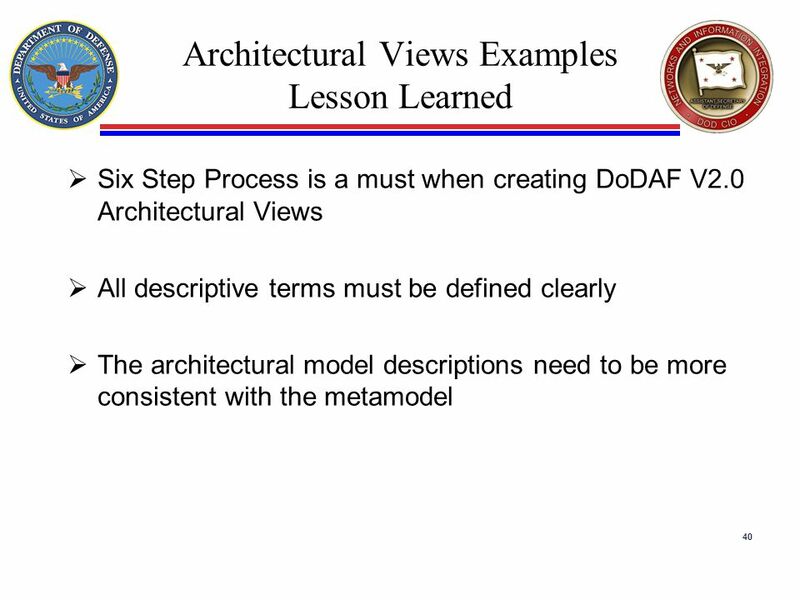 Project Viewpoint Architectural viewpoints are composed of data that has been organized to facilitate understanding. A hierarchy of capabilities which specifies all the capabilities that are referenced throughout one or more Architectural Descriptions. 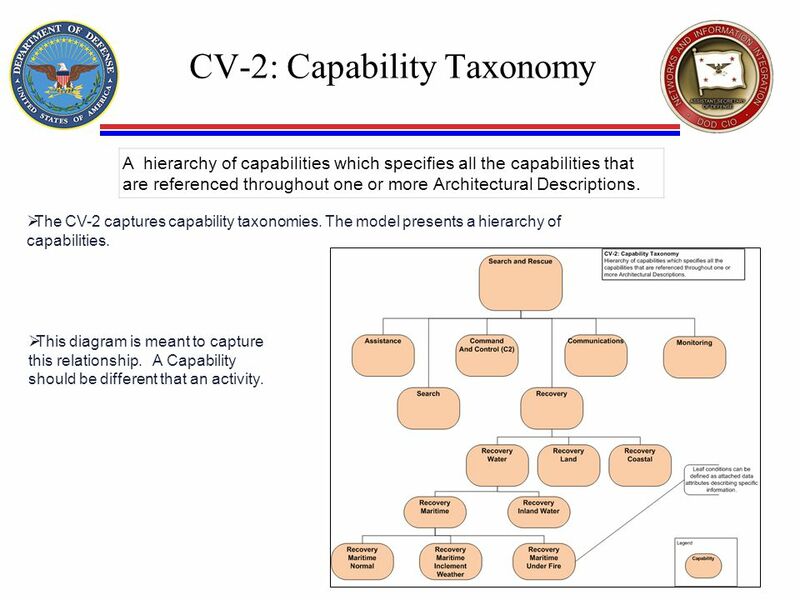 The CV-2 captures capability taxonomies. The model presents a hierarchy of capabilities. This diagram is meant to capture this relationship. A Capability should be different that an activity. The planned achievement of capability at different points in time or during specific periods of time. 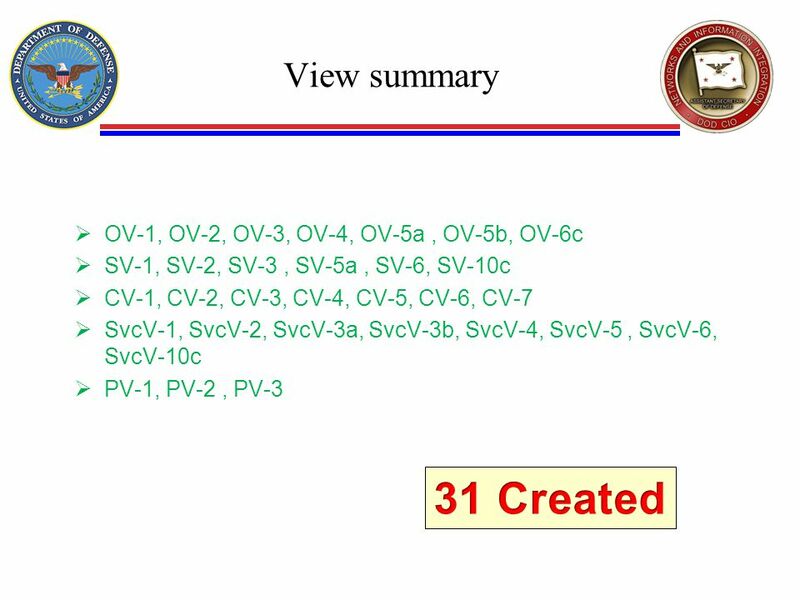 The CV-3 shows the capability phasing in terms of the activities, conditions, desired effects, rules complied with, resource consumption and production, and measures, without regard to the performer and location solutions. 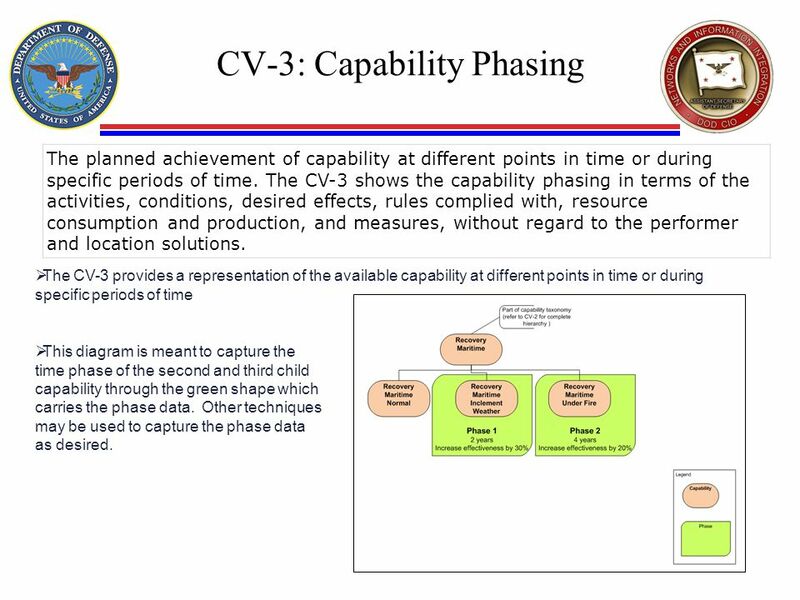 The CV-3 provides a representation of the available capability at different points in time or during specific periods of time This diagram is meant to capture the time phase of the second and third child capability through the green shape which carries the phase data. Other techniques may be used to capture the phase data as desired. The dependencies between planned capabilities and the definition of logical groupings of capabilities. 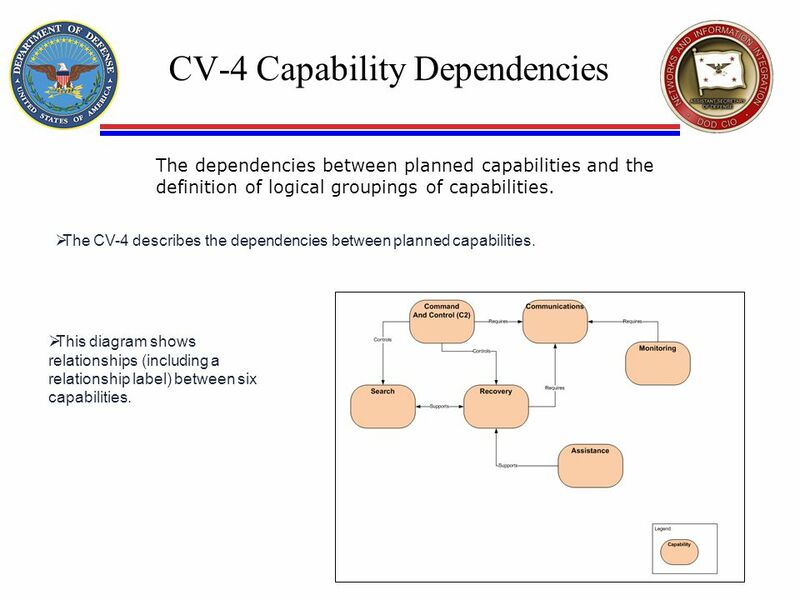 The CV-4 describes the dependencies between planned capabilities. This diagram shows relationships (including a relationship label) between six capabilities. 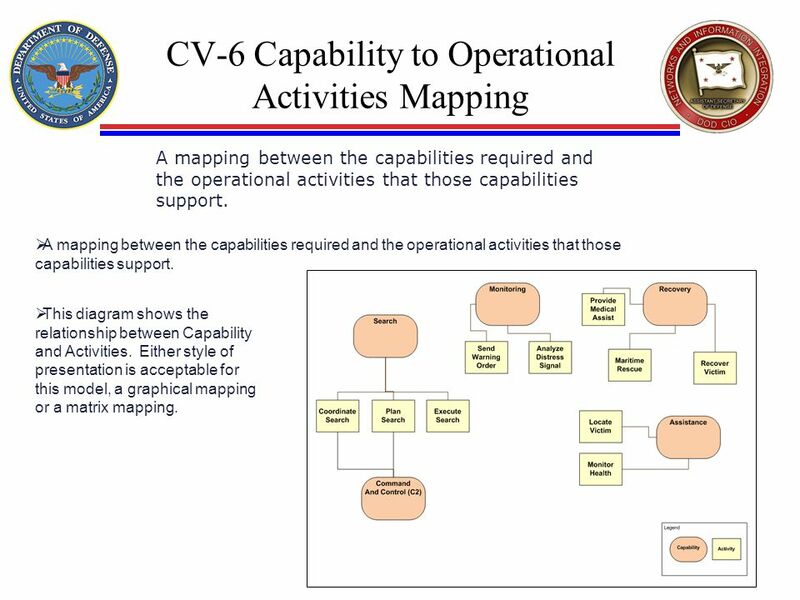 A mapping between the capabilities required and the operational activities that those capabilities support. 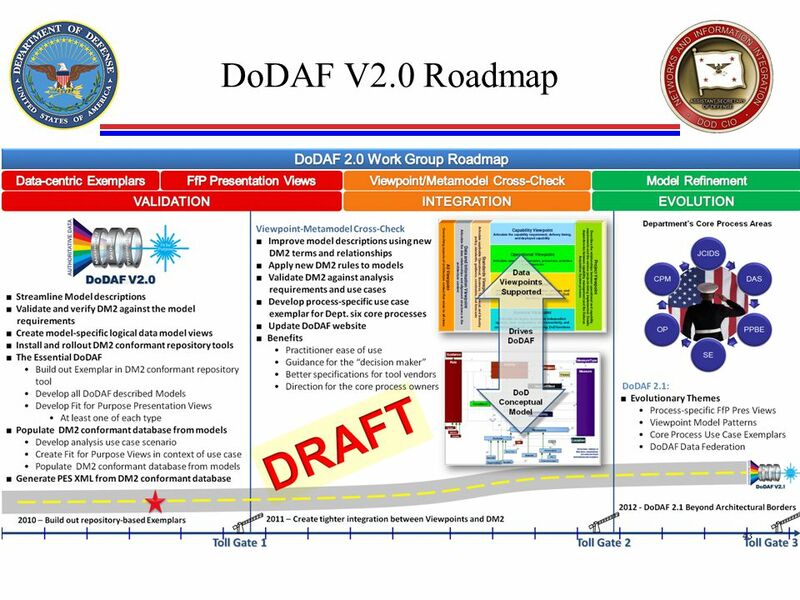 A mapping between the capabilities required and the operational activities that those capabilities support. 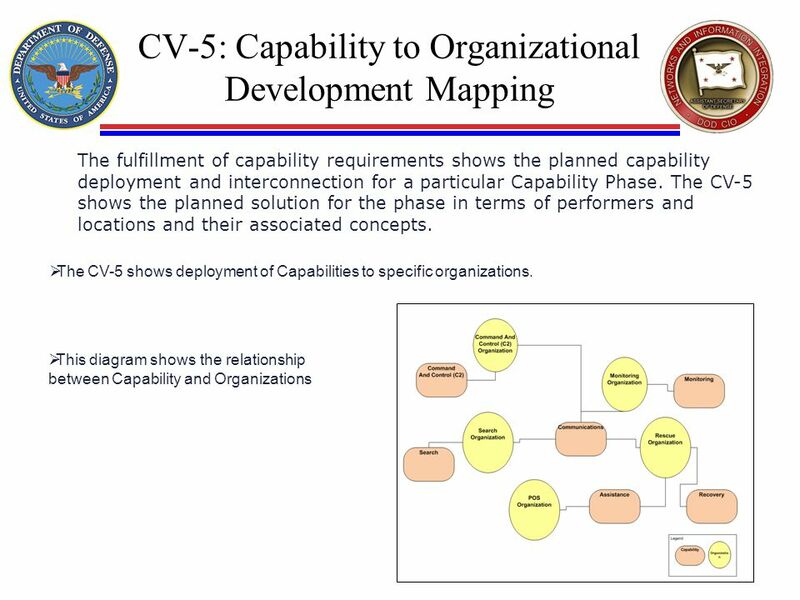 This diagram shows the relationship between Capability and Activities. Either style of presentation is acceptable for this model, a graphical mapping or a matrix mapping. A mapping between the capabilities and the services that these capabilities enable. 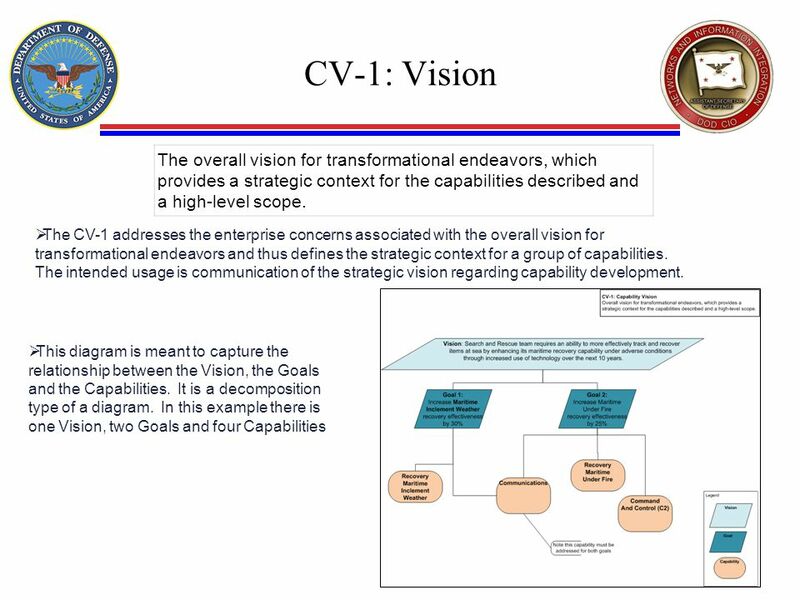 The CV-7 describes the mapping between the capabilities required and the services that enable those capabilities. 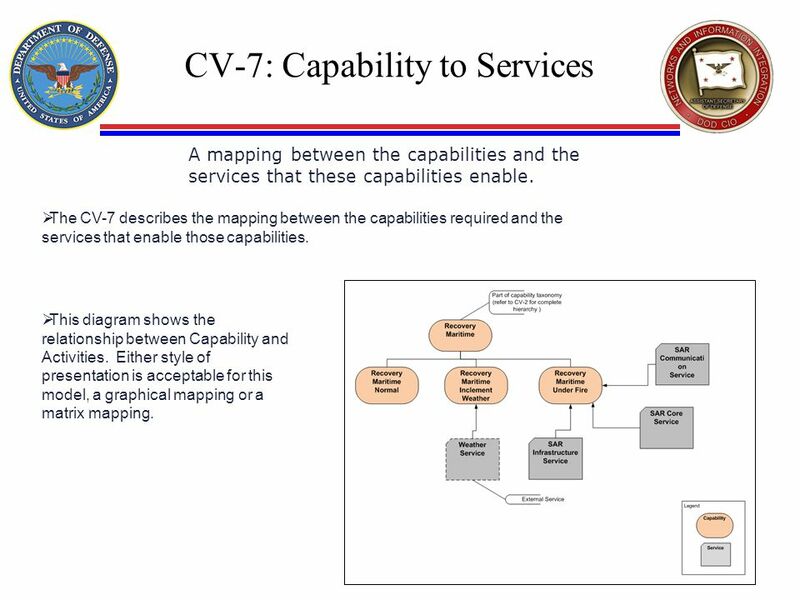 This diagram shows the relationship between Capability and Activities. Either style of presentation is acceptable for this model, a graphical mapping or a matrix mapping. 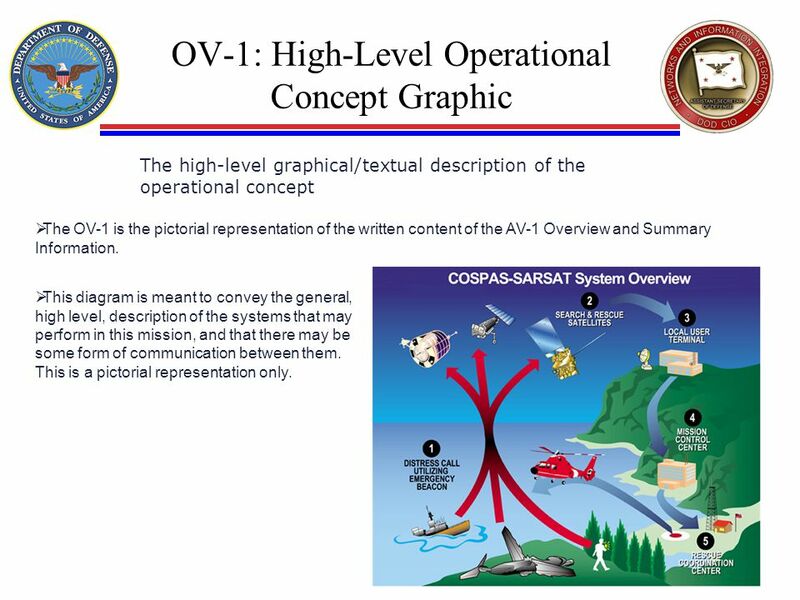 The high-level graphical/textual description of the operational concept The OV-1 is the pictorial representation of the written content of the AV-1 Overview and Summary Information. This diagram is meant to convey the general, high level, description of the systems that may perform in this mission, and that there may be some form of communication between them. This is a pictorial representation only. 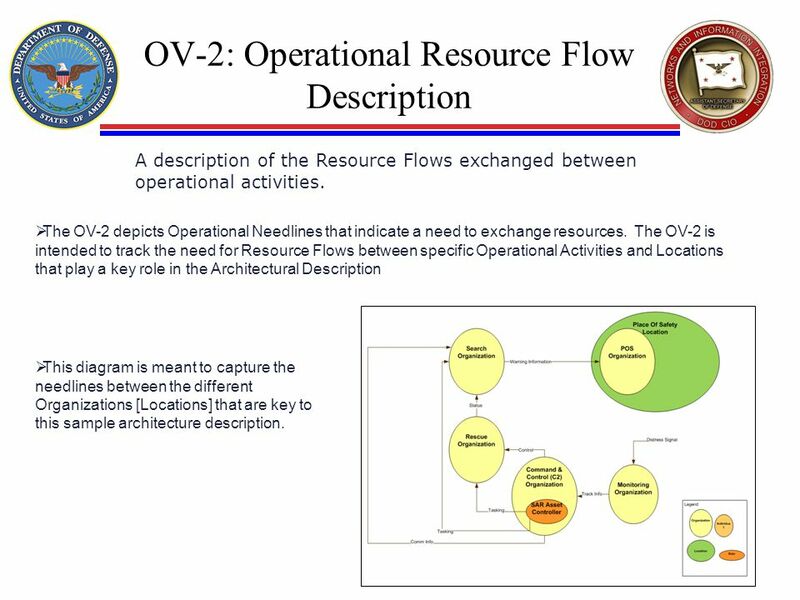 A description of the Resource Flows exchanged between operational activities. The OV-2 depicts Operational Needlines that indicate a need to exchange resources. 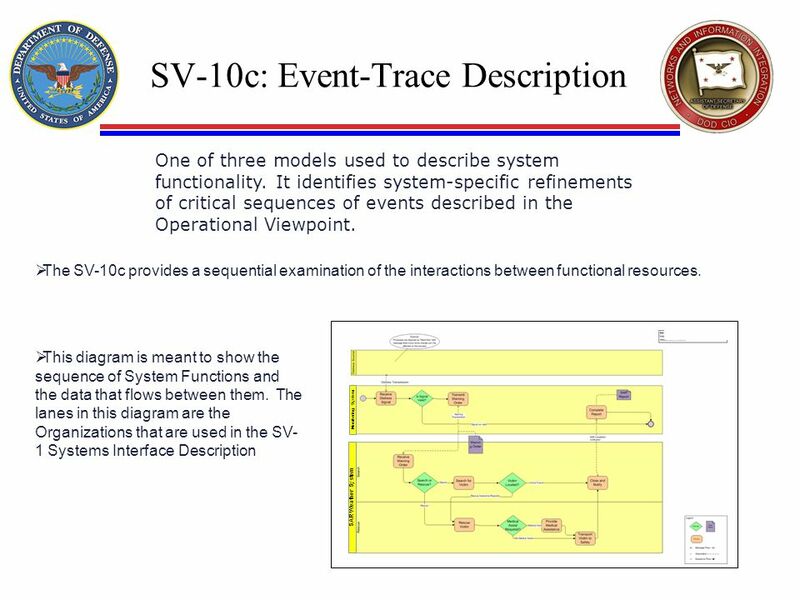 The OV-2 is intended to track the need for Resource Flows between specific Operational Activities and Locations that play a key role in the Architectural Description This diagram is meant to capture the needlines between the different Organizations [Locations] that are key to this sample architecture description. The organizational context, role or other relationships among organizations. 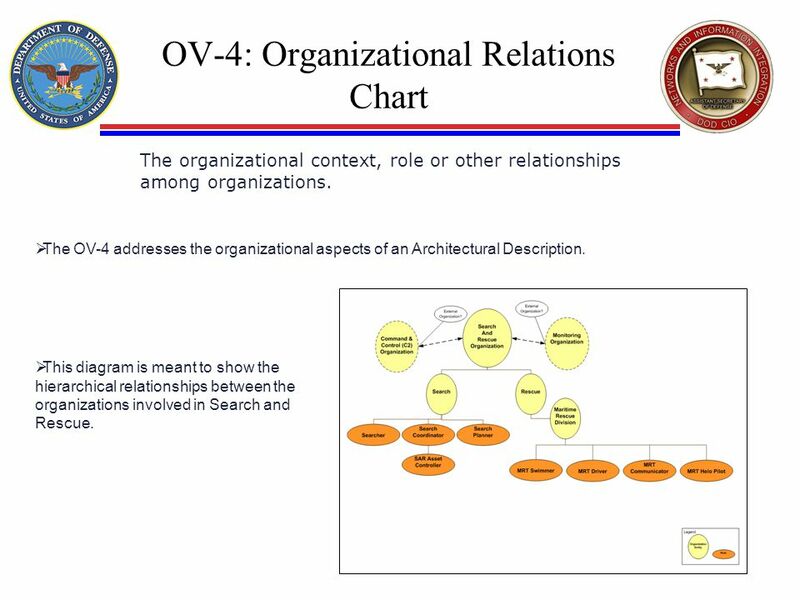 The OV-4 addresses the organizational aspects of an Architectural Description. This diagram is meant to show the hierarchical relationships between the organizations involved in Search and Rescue. 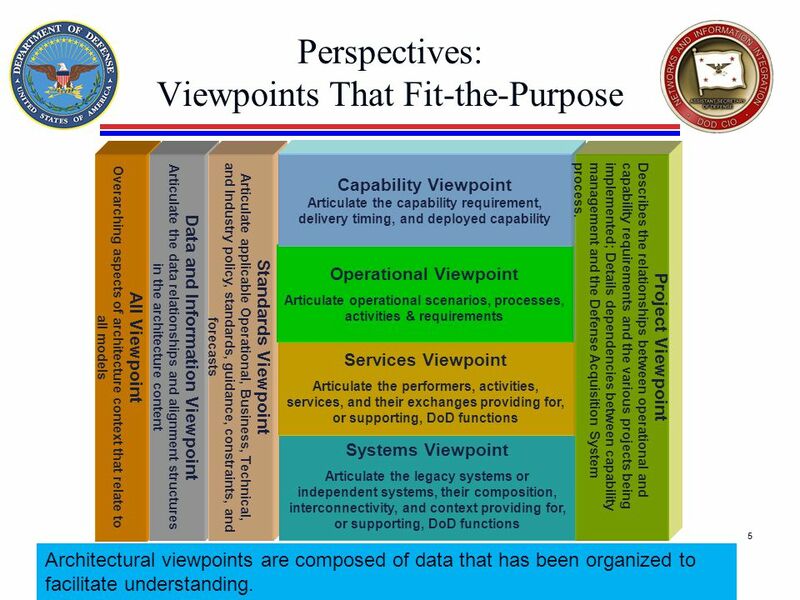 The context of capabilities and activities (operational activities) and their relationships among activities, inputs, and outputs; Additional data can show cost, performers, or other pertinent information. 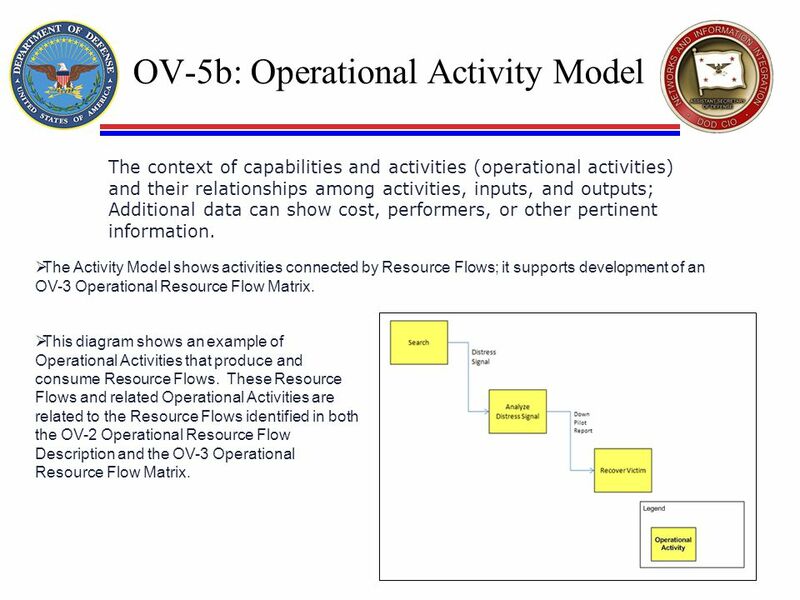 The Activity Model shows activities connected by Resource Flows; it supports development of an OV-3 Operational Resource Flow Matrix. This diagram shows an example of Operational Activities that produce and consume Resource Flows. 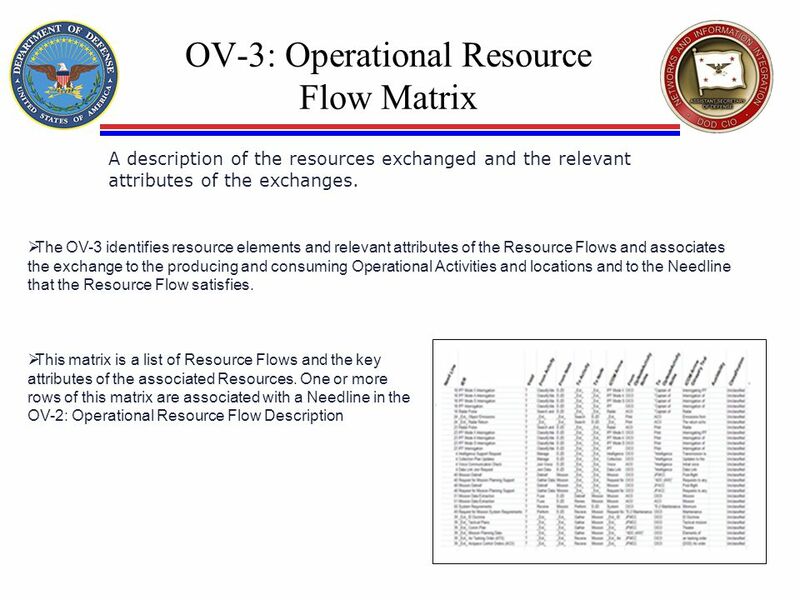 These Resource Flows and related Operational Activities are related to the Resource Flows identified in both the OV-2 Operational Resource Flow Description and the OV-3 Operational Resource Flow Matrix. 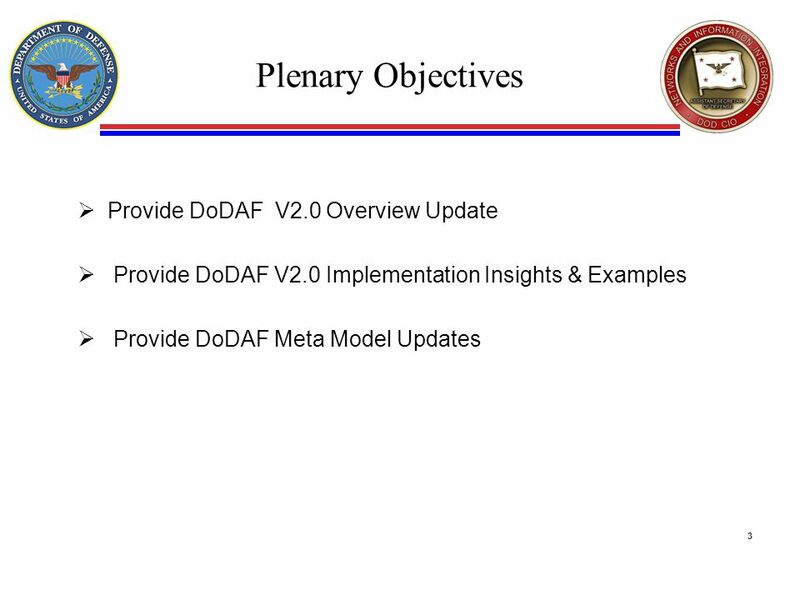 One of three models used to describe activity (operational activity). It traces actions in a scenario or sequence of events. 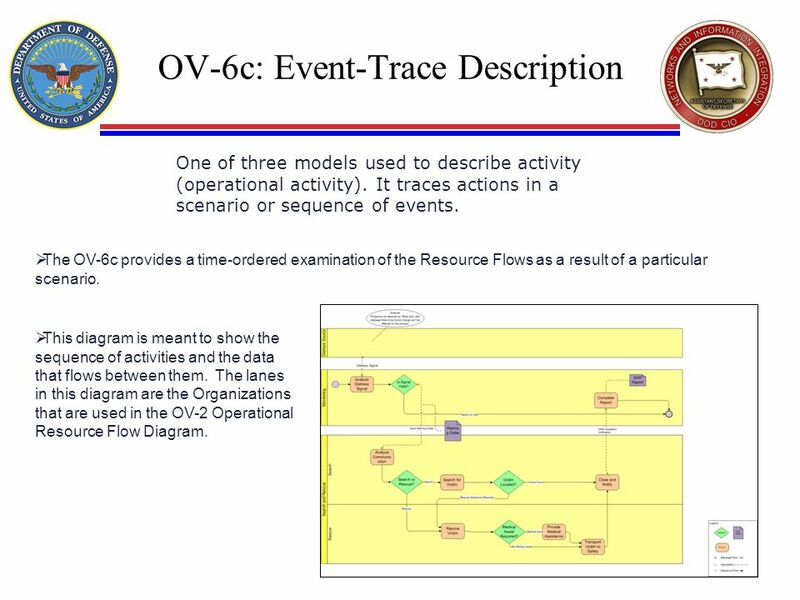 The OV-6c provides a time-ordered examination of the Resource Flows as a result of a particular scenario. This diagram is meant to show the sequence of activities and the data that flows between them. 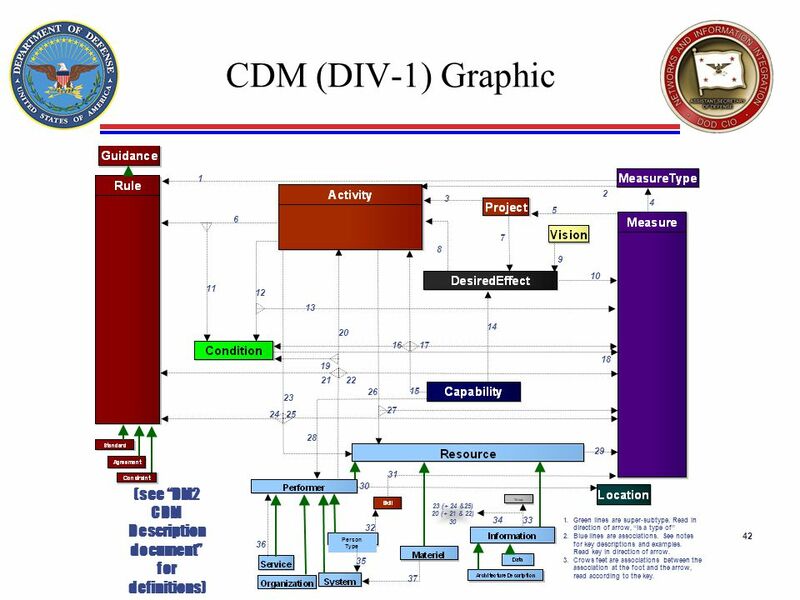 The lanes in this diagram are the Organizations that are used in the OV-2 Operational Resource Flow Diagram. It describes the dependency relationships between the organizations and projects and the organizational structures needed to manage a portfolio of projects. 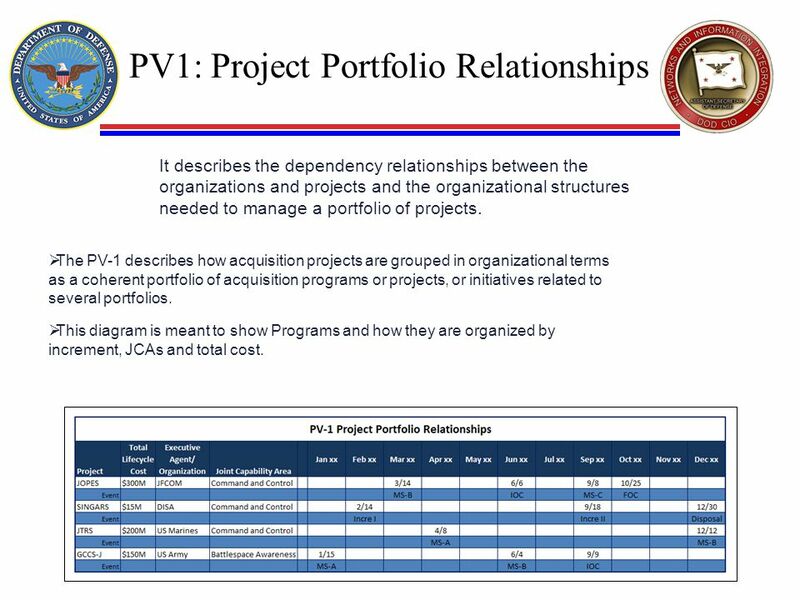 The PV-1 describes how acquisition projects are grouped in organizational terms as a coherent portfolio of acquisition programs or projects, or initiatives related to several portfolios. This diagram is meant to show Programs and how they are organized by increment, JCAs and total cost. 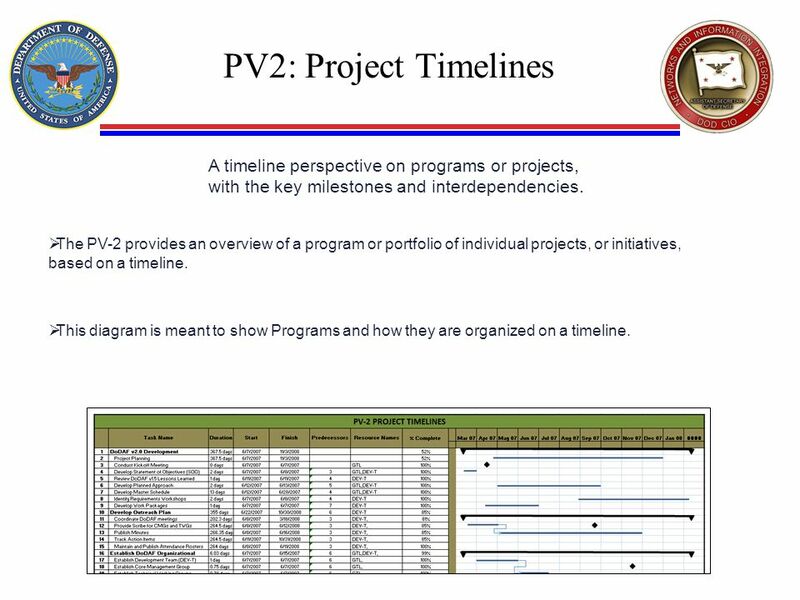 24 PV2: Project Timelines A timeline perspective on programs or projects, with the key milestones and interdependencies. The PV-2 provides an overview of a program or portfolio of individual projects, or initiatives, based on a timeline. This diagram is meant to show Programs and how they are organized on a timeline. 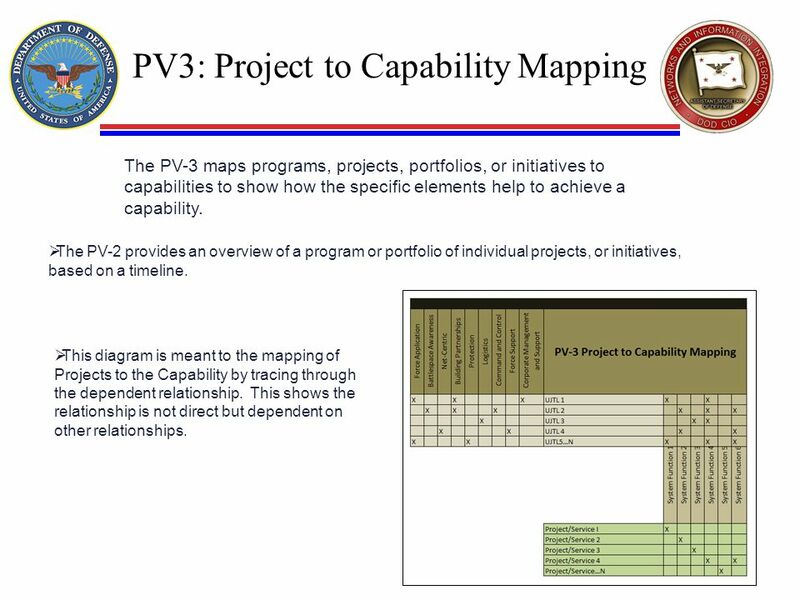 The PV-3 maps programs, projects, portfolios, or initiatives to capabilities to show how the specific elements help to achieve a capability. The PV-2 provides an overview of a program or portfolio of individual projects, or initiatives, based on a timeline. This diagram is meant to the mapping of Projects to the Capability by tracing through the dependent relationship. This shows the relationship is not direct but dependent on other relationships. 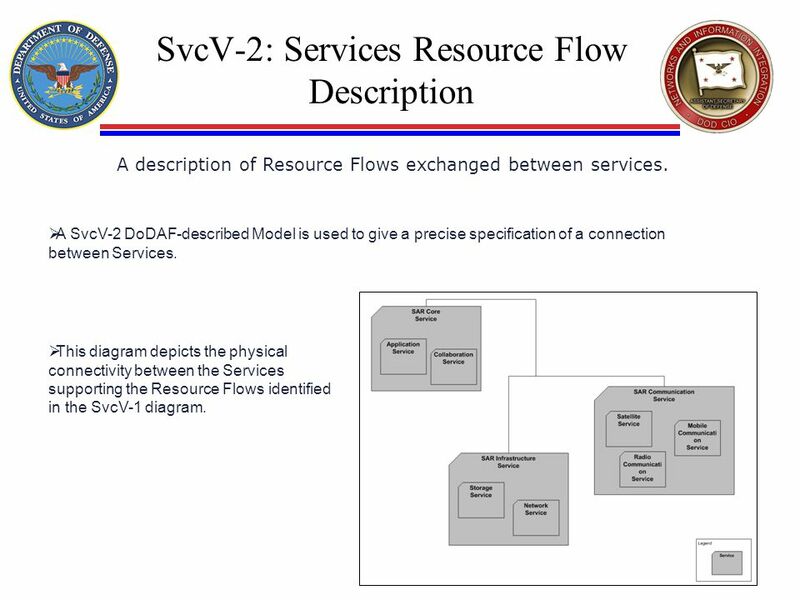 A description of Resource Flows exchanged between services. 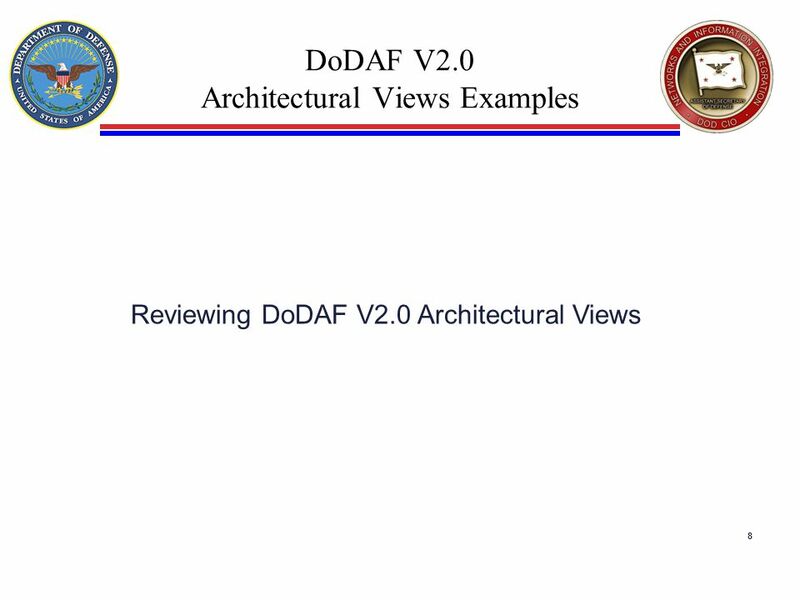 A SvcV-2 DoDAF-described Model is used to give a precise specification of a connection between Services. This diagram depicts the physical connectivity between the Services supporting the Resource Flows identified in the SvcV-1 diagram. The relationships among services in a given Architectural Description. 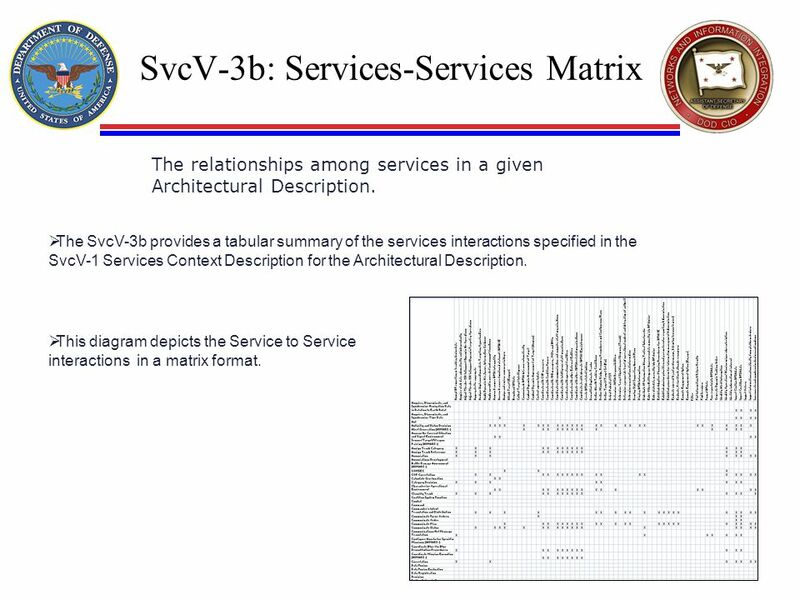 The SvcV-3b provides a tabular summary of the services interactions specified in the SvcV-1 Services Context Description for the Architectural Description. This diagram depicts the Service to Service interactions in a matrix format. 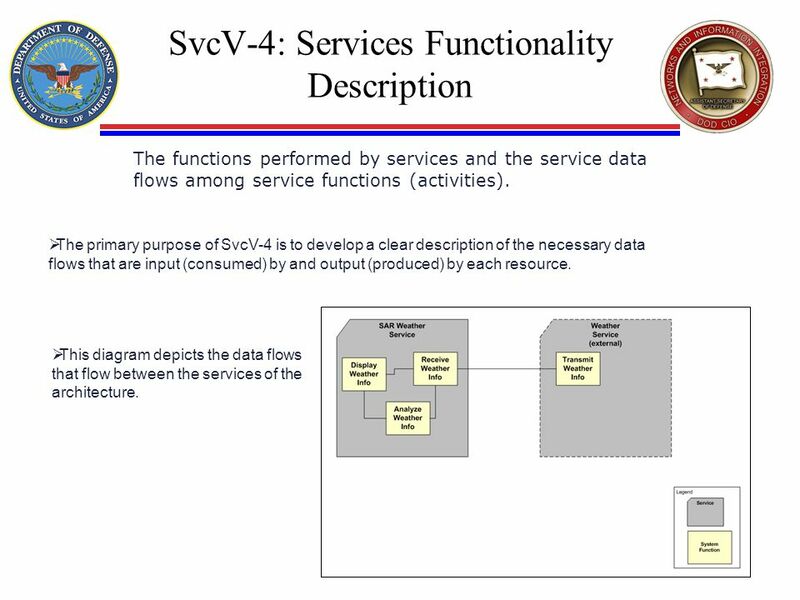 The functions performed by services and the service data flows among service functions (activities). The primary purpose of SvcV-4 is to develop a clear description of the necessary data flows that are input (consumed) by and output (produced) by each resource. This diagram depicts the data flows that flow between the services of the architecture. A mapping of services (activities) back to operational activities (activities). 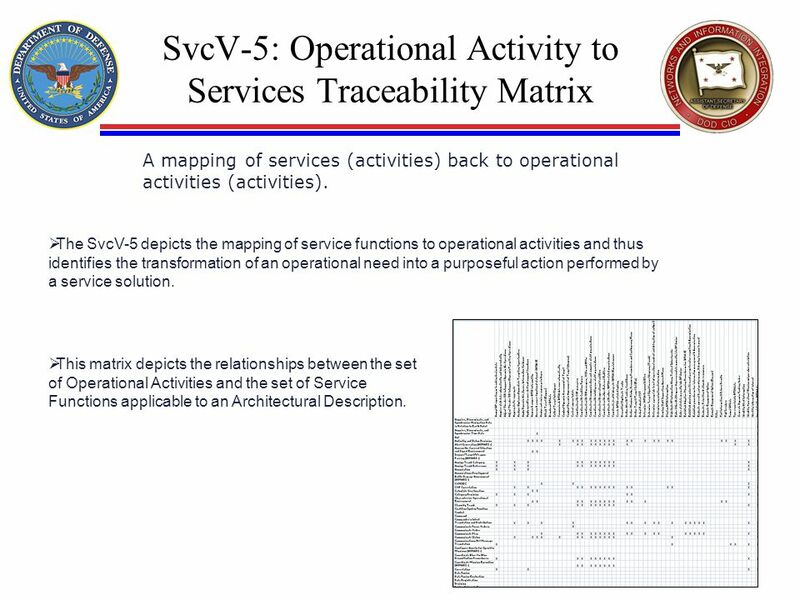 The SvcV-5 depicts the mapping of service functions to operational activities and thus identifies the transformation of an operational need into a purposeful action performed by a service solution. 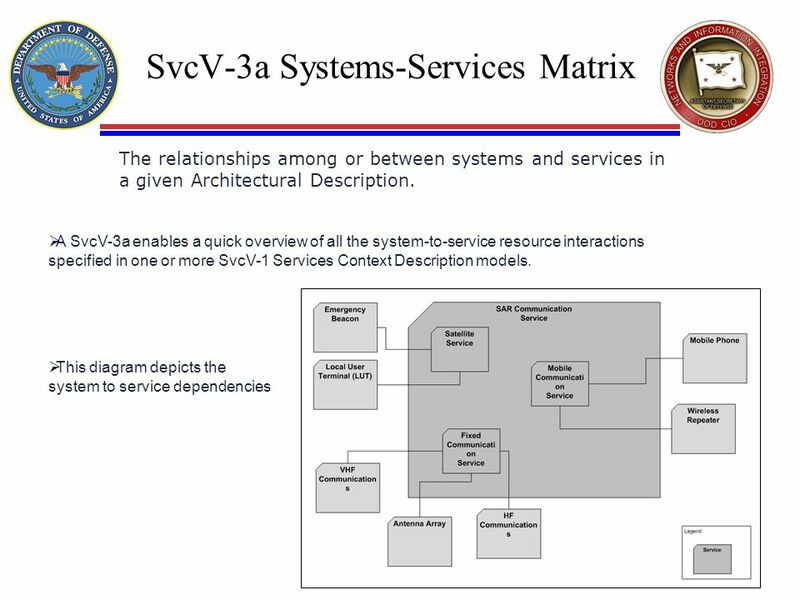 This matrix depicts the relationships between the set of Operational Activities and the set of Service Functions applicable to an Architectural Description. A description of the resources exchanged and the relevant attributes of the exchanges. 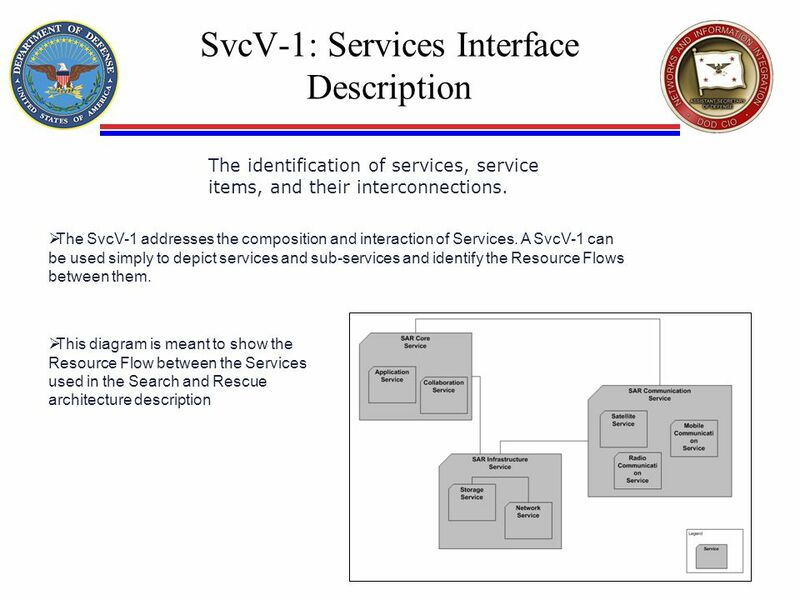 The SvcV-6 specifies the characteristics of the Service Resource Flows exchanged between Services. 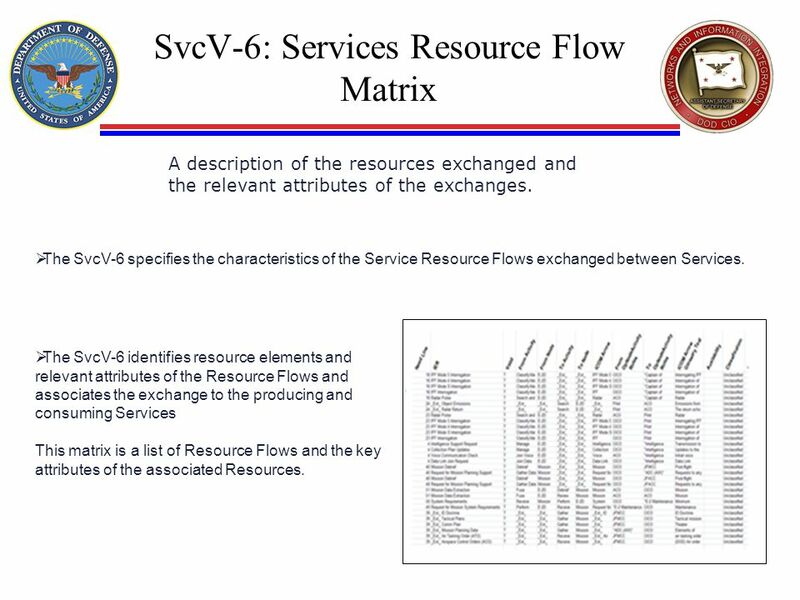 The SvcV-6 identifies resource elements and relevant attributes of the Resource Flows and associates the exchange to the producing and consuming Services This matrix is a list of Resource Flows and the key attributes of the associated Resources. The identification of systems, system items, and their interconnections. 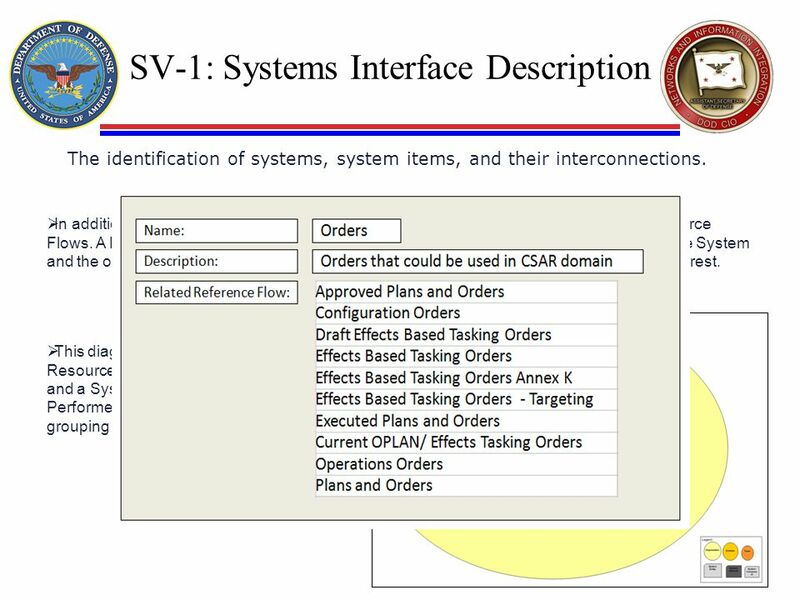 In addition to depicting Systems (Performers) and their structure, the SV-1 addresses Resource Flows. A Resource Flow, as depicted in SV-1, is an indicator that resources pass between one System and the other. The SV-1 depicts all System Resource Flows between Systems that are of interest. This diagram is meant to show the Resource Flows between a Person Type and a System (both are types of Performer). The diagram also shows the grouping of Performer Types. A description of Resource Flows exchanged between systems. 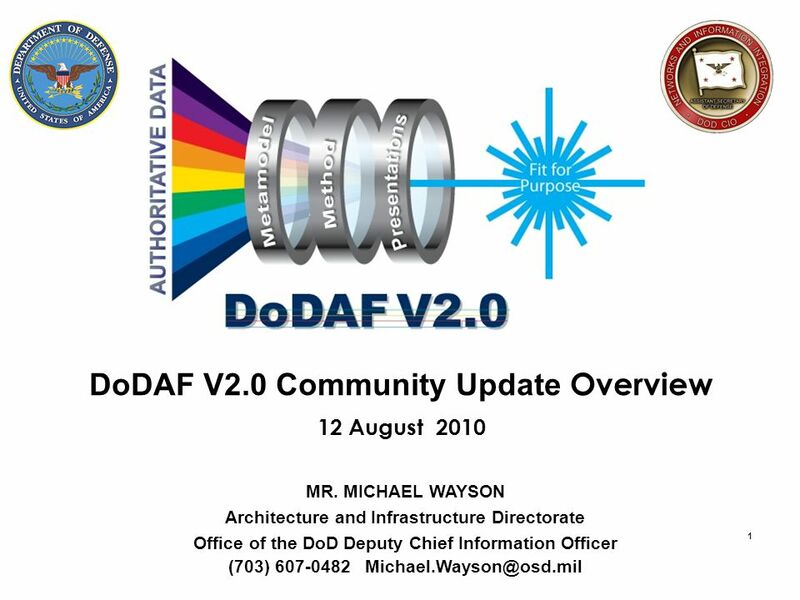 A SV-2 DoDAF-described Model is used to give a precise specification of a connection between Systems. This may be an existing connection, or a specification for a connection that is to be made. This diagram is meant to show a representation of the primary physical connection between the systems of interest. The relationships among systems in a given Architectural Description. It can be designed to show relationships of interest, (e.g., system-type interfaces, planned vs. existing interfaces). 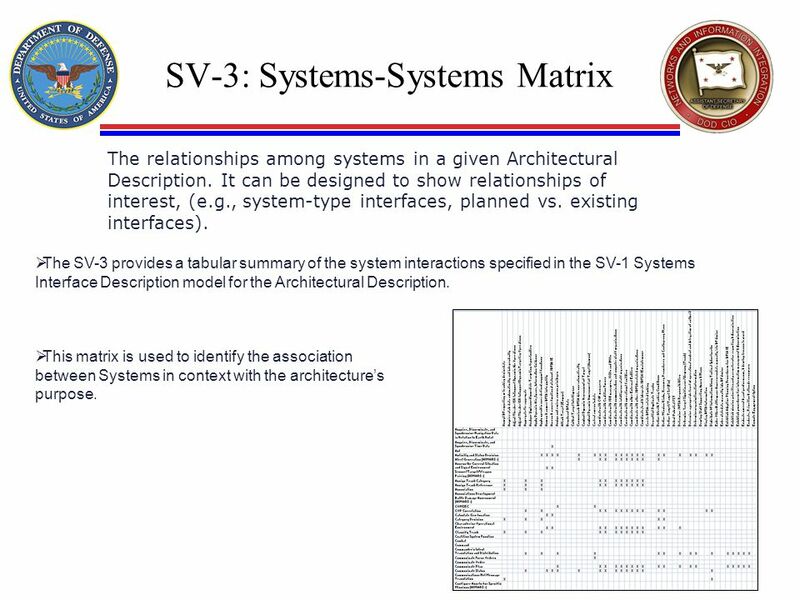 The SV-3 provides a tabular summary of the system interactions specified in the SV-1 Systems Interface Description model for the Architectural Description. This matrix is used to identify the association between Systems in context with the architecture’s purpose. A mapping of system functions (activities) back to operational activities (activities). 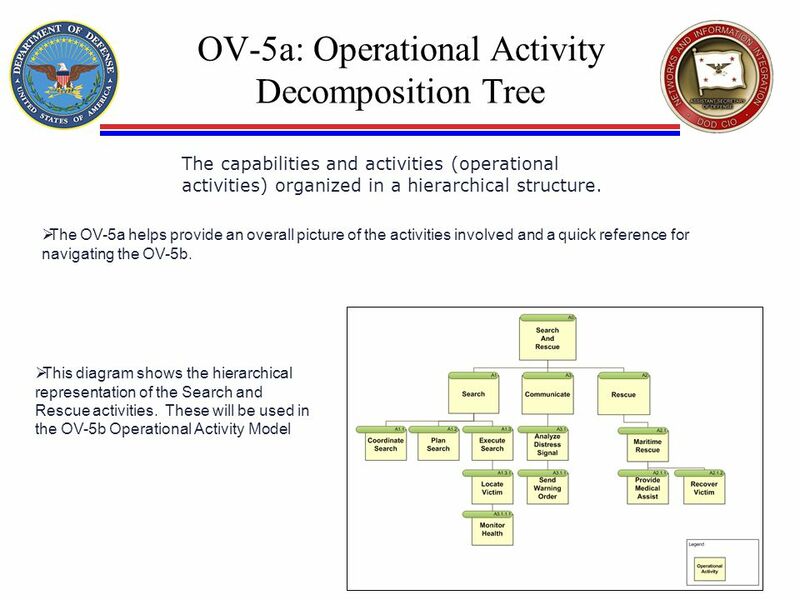 The SV-5a addresses the linkage between System Functions described in SV-4 Systems Functionality Description and Operational Activities specified in OV-5a Operational Activity Decomposition Tree or OV-5b Operational Activity Model. 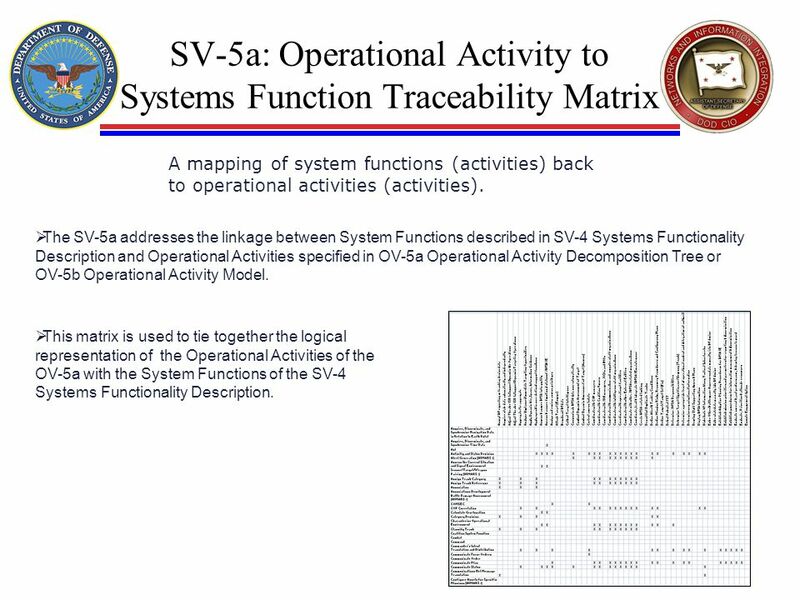 This matrix is used to tie together the logical representation of the Operational Activities of the OV-5a with the System Functions of the SV-4 Systems Functionality Description. Provides details of system resource flow elements being exchanged between systems and the attributes of that exchange. 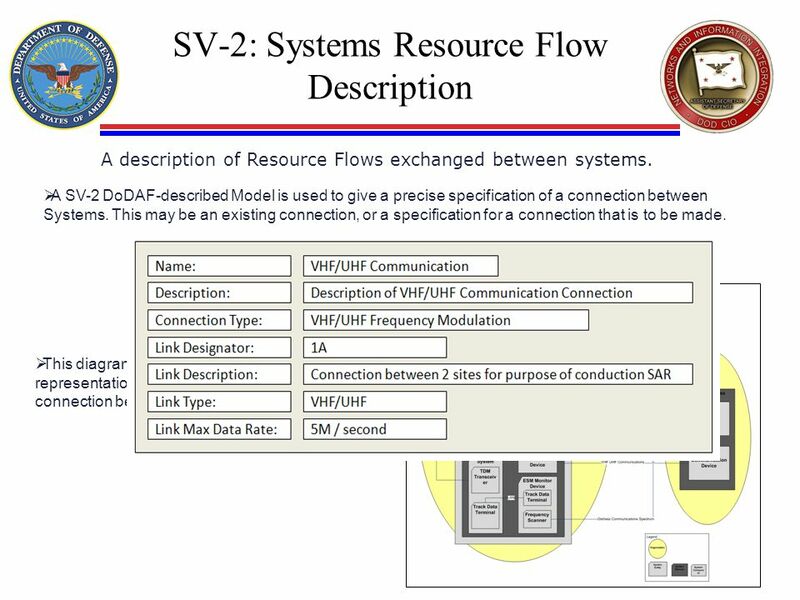 The SV-6 focuses on the specific aspects of the system Resource Flow and the system Resource Flow content in a tabular format. 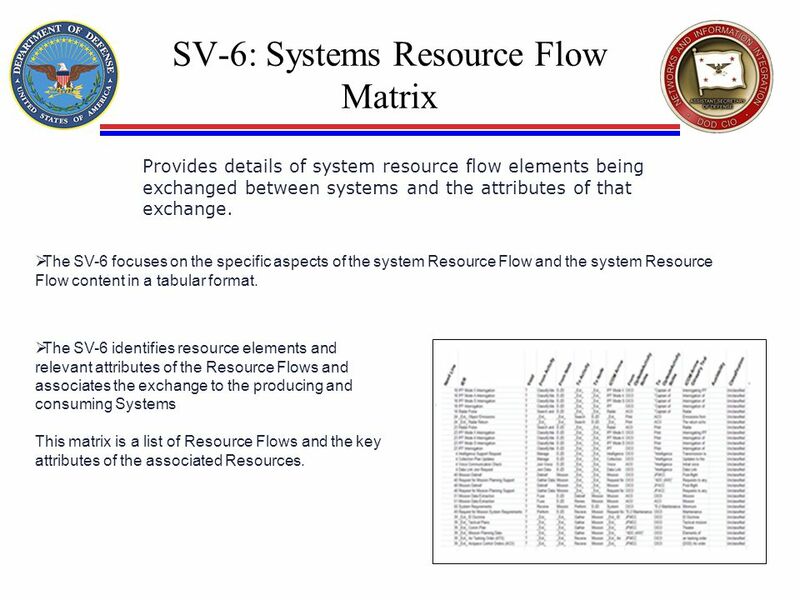 The SV-6 identifies resource elements and relevant attributes of the Resource Flows and associates the exchange to the producing and consuming Systems This matrix is a list of Resource Flows and the key attributes of the associated Resources. 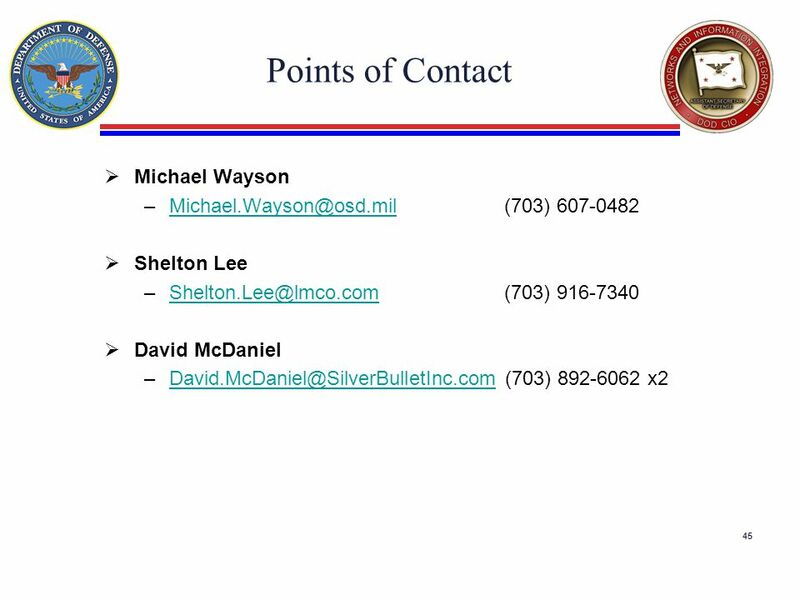 Shelton Lee (703) David McDaniel (703) x2 It is important to note at the outset that utilizing this methodology for your architecture effort is NOT mandatory. 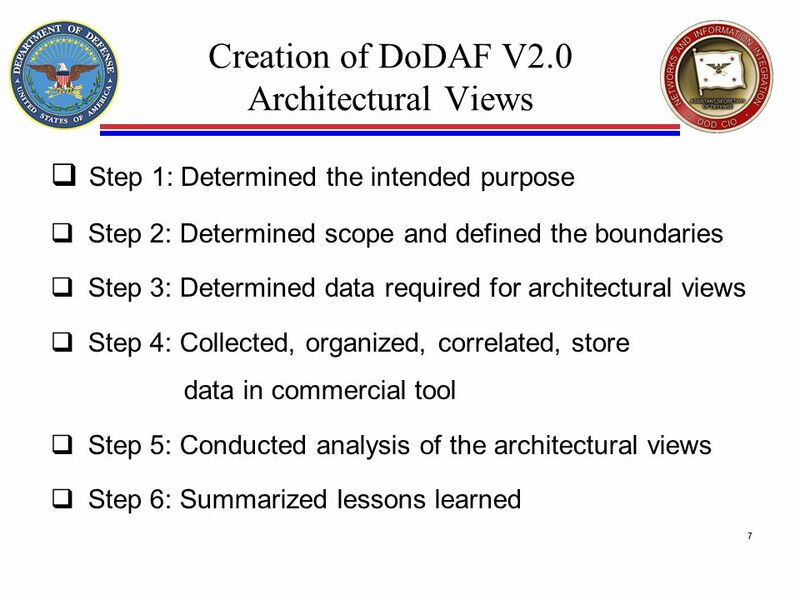 It has been provided in DoDAF 2.0 as a means for organizations to adopt a generic, easy-to-use method for creating an architectural description, and for new teams with little experience. If an organization prefers to use its own methods, then the generic methodology is there to compare to ensure that all the needed steps are contained in the methodology the organization prefers to use in its own efforts. 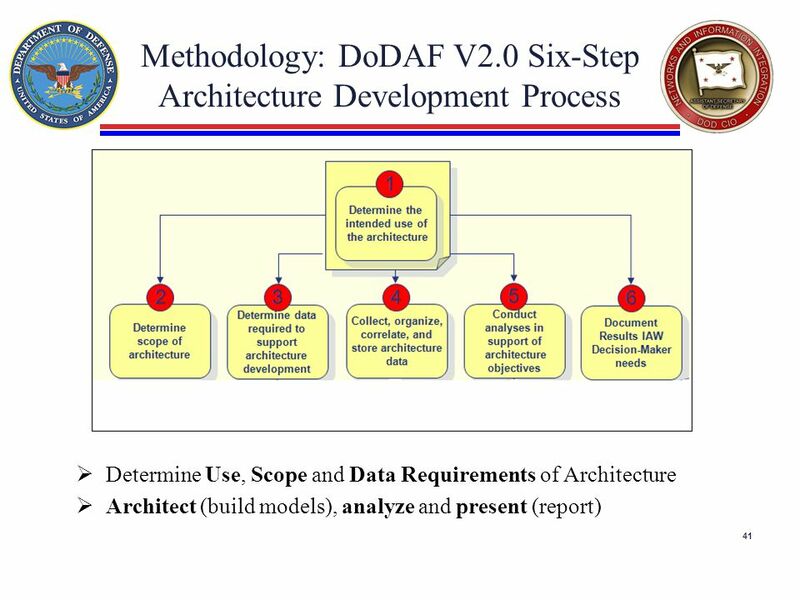 There are six steps is the DoDAF methodology: 1-Determine the intended use of the architecture 2- Determine the scope of the architecture 3- Determine data required to support architecture development 4- Collect, organize, correlate and store data 5- Conduct analysis in support of architecture objectives 6- Document results Managers don’t do all of these steps. The first 2 (speak to) are the managers’ domain, as is Step 5. The rest are the domain of the architect and development team, with the manager acting as a subject-matter expert, where needed. 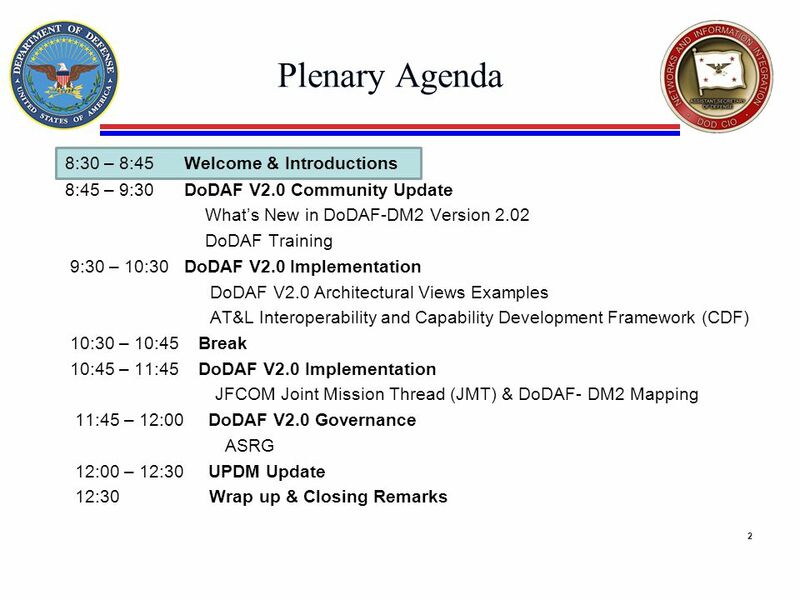 Download ppt "DoDAF V2.0 Community Update Overview"
EA Demonstration Study : Dissemination Forum – 8 June EA Views and Sub-views Patrick Bardet EA Unit. 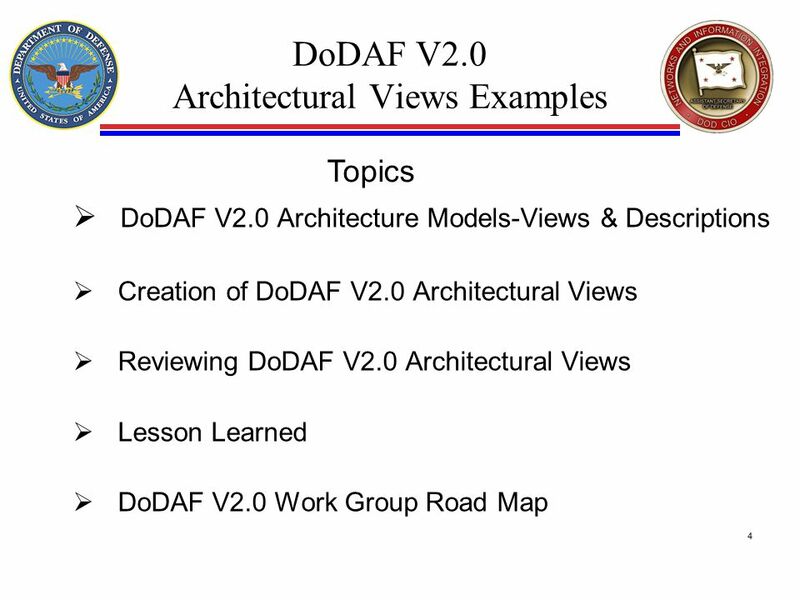 Scope of TOGAF ADM The scope of the four architecture domains of TOGAF align very well with the first four rows of the Zachman Framework, as shown in the. 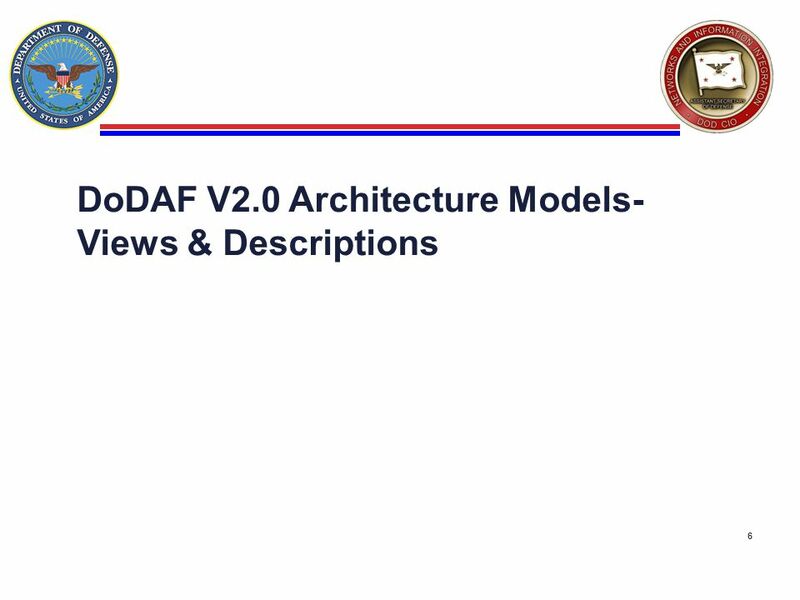 Reference Models مدل های مرجع معماری. 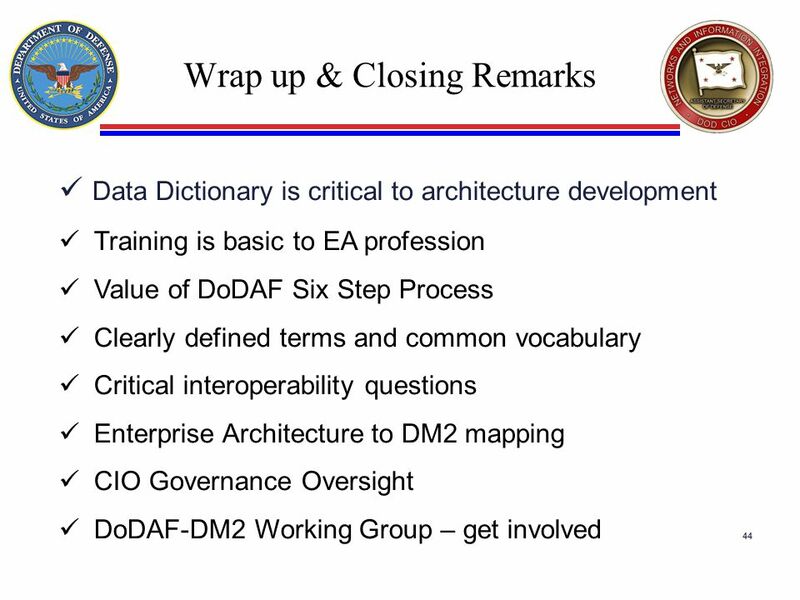 Business Driven Enterprise Architecture Assessment Methodology Josh Arceneaux August 16, 2011. Creating Architectural Descriptions. Outline Standardizing architectural descriptions: The IEEE has published, “Recommended Practice for Architectural.